Native apps can be by far the best way to deliver an application or service, but only if well designed. And websites need to remember that “No” means “No”. Let’s be careful to differentiate between casual website visitors, and those users of the service who’d really benefit most from a dedicated application. Endurance sports may not be the most obvious place to find a social media revolution. There is no fixed time window for a bike ride: Some people are limited to weekends; others may grab a spare hour in the early morning, or pack a ride into their lunchtime. For a few, it’s a day job. One thing that’s certain, however, is that cyclists are voracious adopters of technology. We love carbon things, and shiny things, and faster things. Technical innovation is a big part of the professional sport, and that element trickles strongly down to the recreational level, at a relatively affordable price compared to other technology-focused sports such as motor racing. It’s perhaps no suprise, then, that cyclists were very early adopters of recreational GPS devices. Many of us are map geeks, but that still doesn’t mean we want to have to retrieve a soggy scrap of paper from the tree it has just blown into for the third time. This trend started in 2000 with a mini-revolution, brought about by a key policy change. On May 1st, US President Bill Clinton turned off selective availability, an artificial wobbling error which had deliberately reduced the accuracy of the non-military Global Positioning System signal. For the first time, consumers could fix their location not just to a vague area of a few hundred metres, but right to the very trail they were standing on, walking along, or cycling up. 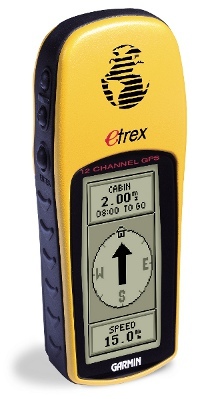 President Clinton’s move drove the huge success of generation of cheap, rugged handheld GPS devices like the Garmin Etrex, launched that same year. As the decade progressed, these gadgets increasingly began to adorn bike handlebars and hike backpacks. These gadgets didn’t just bring easier navigation… they brought tracking and logging. Riders keenly compiled their own statistics, and were able to share routes easily with others. A new outdoor-focused software industry sprang up, with companies like Anquet, Memory Map and Tracklogs combining detailed mapping with GPS connectivity to make the best of those basic early devices. The sophistication of recreational GPS units continued to increase, but it was a trend that would soon be overwhelmed by a new development. In 2007, smartphones phones such as Nokia’s N95 began to be shipped with built in GPS units. Suddenly, people didn’t have to buy a navigation device to take advantage of GPS navigation. It was right there in their pocket. And while recreational GPS units had shipped by the million, smartphones ship by the hundreds of millions, every year. .
From a gadgetry point of view, the trend has pushed Garmin towards a more specialist sporting GPS market, with high-end devices featuring integrated heart-monitors, cadence (pedalling rate) sensors and more. The associated software, meanwhile, made an inevitable shift to the mobile device market, and a flood of applications hit the online stores. The concept, of course, is pretty simple. Launch the app. Press “Start” at the beginning of a walk, or bike ride, or jog, or swim. Hmm, perhaps not a swim. Put phone in safe pocket. Press “End” at the end. The application measures the GPS log, overlays it with public or commercial mapping data, and calculates metrics such as distance, elevation gain, and time. It’s all saved to a log of the person’s activities, enabling them to repeat routes, compare previous activities, and view overall achievements and stats. Most of these apps look pretty similar, and there are plenty of them, as any quick App Store search will reveal. 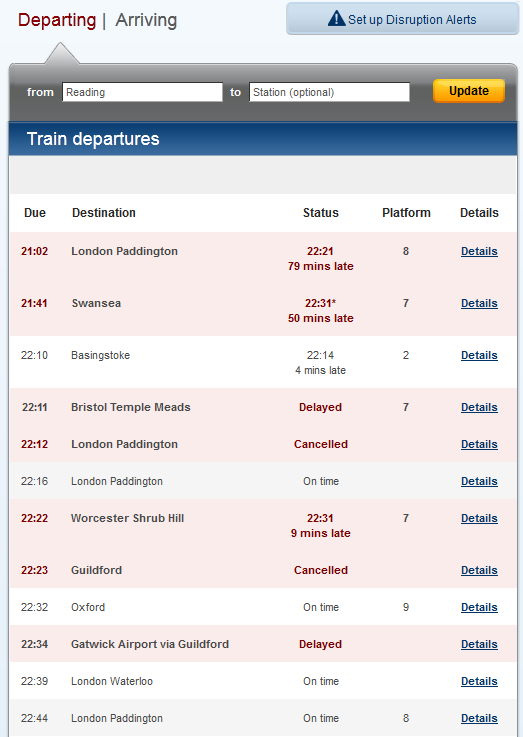 This now brings us to Strava. Strava was publically launched in 2009 (although there are rides logged dating back to the spring of 2008). It was the brainchild of two Harvard alumni, Michael Horvath and Mark Gainey. The concept was pretty standard – Strava is a ride logging system that interfaces with a smartphone’s GPS via a native app, or takes a website upload from recreational GPS devices. Strava showed from early on that they had some new ideas. They introduced a neat feature called the KOM, or “King of the Mountain”. Named after the prize given to the best mountain climber in professional events such as the Tour de France, KOMs were originally awarded to riders who’d made the fastest ascent of pre-defined climbs. 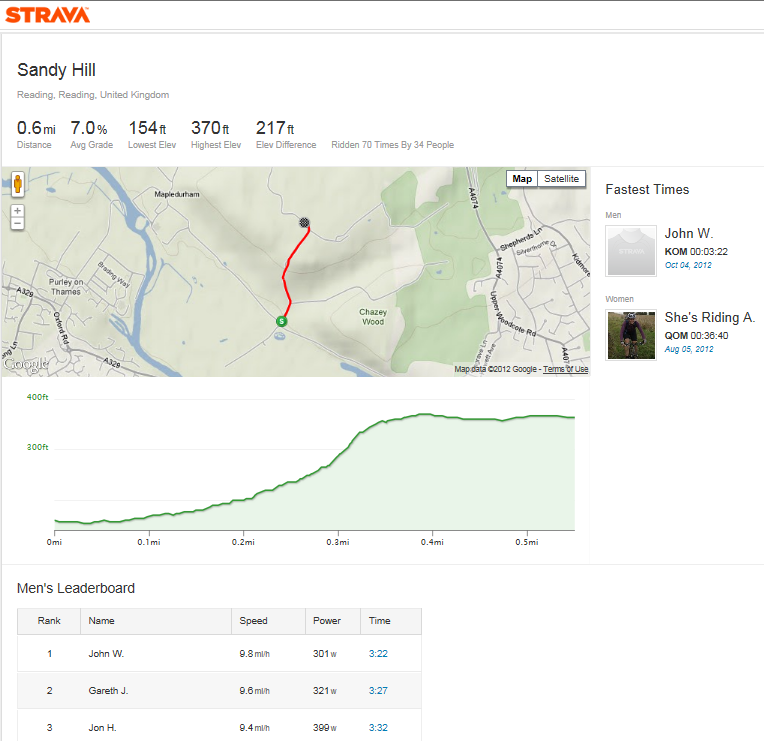 Part of Strava’s leaderboard for Sandy Hill, near Reading.Yes, that’s me in 3rd, and yes, I want my KOM back. Strava has differentiated itself by turning what was previously a solo experience into a shared one. The gentle pseudo-competition of competing for KOMs is addictive, fun, and much easier and cheaper than entering and travelling to races. The use of simple social network features like friend lists, chat, and “Kudos” (a simple thumbs up to convey one’s admiration of another rider’s achievements) have built a thriving community. They’ve cleverly signed up big name riders like the USA’s Taylor Phinney, so users can follow the achievements of the pros (and feel mildly inadequate at the gulf between our abilities and theirs!). In the process, they’ve motivated a lot of people to ride more, not least through some neat little tricks. We work hard to secure a KOM, and finally get there, only for the “Uh oh!” email to pop into our mailbox a short while later, breaking the bad news to us that we’ve been beaten. Perhaps we’d like to get out there and have another go? 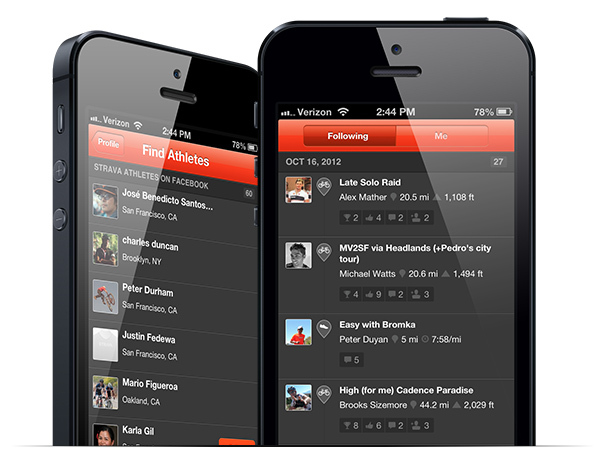 Strava is a classic story of a commodity concept being revolutionized by Social Media. In 2011, the influential VeloNews magazine voted Strava their technical innovation of the year (no mean feat in a high-income-demographic sport sector, full of carbon fibre and titanium bling). Alexa’s site stats show how they have comfortably passed some of 2011’s big names like MapMyRide (who in 2012 have been trying to play catch-up on the leaderboard model). Even the seasonal northern hemisphere winter slump doesn’t significantly dent a very strong growth. I fully expect next summer to see them rocketing northwards. This growth is impressive particularly because this segment should really have inertia on its side. After building up a set of logs on one site, there’s a strong incentive to stay there, particularly when it’s not always easy to move data to a new site (as noted with some light hearted profanity in articles like this one). Strava is compelling enough to make users walk away and start again. Importantly, Strava has embedded itself in the consciousness of recreational cyclists. It is THE talked about app on the forums, and appears to be reaching an important critical mass whereby it is normal for hobbyist cyclists to have an account. Participants are committed and enthusiastic: A recent challenge on the Strava site encouraged riders to attempt a 79 mile ride over one three-day weekend. They got almost 11,000 signups, of whom an amazing 7,000 successfully completed the task. Strava is a social and motivational phenomenon. Socialization is an incredibly powerful, market-changing concept. It’s there to be harnessed: our users now carry better gadgets than our companies ever lent them, and they interact with them in more aspects of their lives than the IT industry ever really imagined they would. People like to collaborate, compare, convey their stories and experiences. They like to see the admire the achievements of others and to learn what is achievable. It’s motivating and it’s fun. These concepts are a huge disruptor. They have changed sector after sector, and they’ll change ours.